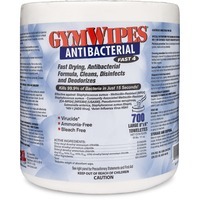 GymWipes Antibacterial Towelettes are an easy, hygienic way to lower the risk of infection and cross contamination. Perfect for controlling and eliminating organisms on high traffic surfaces that people come into contact with every day, they sanitize surfaces and kill 99 percent of bacteria in 15 seconds. EPA registered disinfectant wipes work well on acrylics. Once applied, the formula dries fast. They are alcohol free, bleach free and phenol free. Each extra thick, super absorbent wipe measures 8 x 6. Disposable wipes refill the 2XL Antibacterial GymWipes Bucket sold separately.